Well, it’s very slightly early, but I thought that I’d wish you all a Happy New Year 🙂 I’d originally, planned to make the usual “new year” painting that I’ve made for the past few years, but then I thought of a better idea that involved the characters from my occasional webcomic series (who last showed up just before Christmas and on Christmas day). This picture ended up being a sci-fi cartoon because, although next year will probably just be more of the same, at least “2017” sounds futuristic. As this post from earlier this month explains, I’d originally planned to make a full-length comic instead, but this idea didn’t work out. Well, I still wasn’t feeling as inspired as I’d hoped to be – so, today’s digitally-edited painting is another slightly random and slightly minimalist one. Although I’ll post the usual list of my ten favourite articles from this month tomorrow, I thought that I’d do something a bit different today, since it is near the end of the year. One of the things that really surprised me about this year (and late last year) was the fact that I finally got back into making webcomics again after making a few traditional-style comics last year. In fact, I ended up posting over a hundred new comic updates for my occasional “Damania” webcomic series (which I began in 2011/2012) this year, spread out over something like nine or ten short mini series. Although I made some of these new comics last autumn/winter, I didn’t actually post any of them online until this year. So, since there were a lot more comics posted here this year than I expected and because the quality of the updates varied somewhat, I thought that I’d show you my top ten “Damania” comics from this year and give you some commentary about them too. These are the four main characters from my long-running occasional “Damania” webcomic series (in chronological order, based on first appearance). All ten of these comics are released under a Creative Commons BY-NC-ND licence. Likewise, you can see a larger version of each comic update by clicking on it. 10) “Damania Returns – Cool Buildings”: Although ‘Damania Returns‘ is my least favourite mini series, I really liked how one particular comic from it turned out. 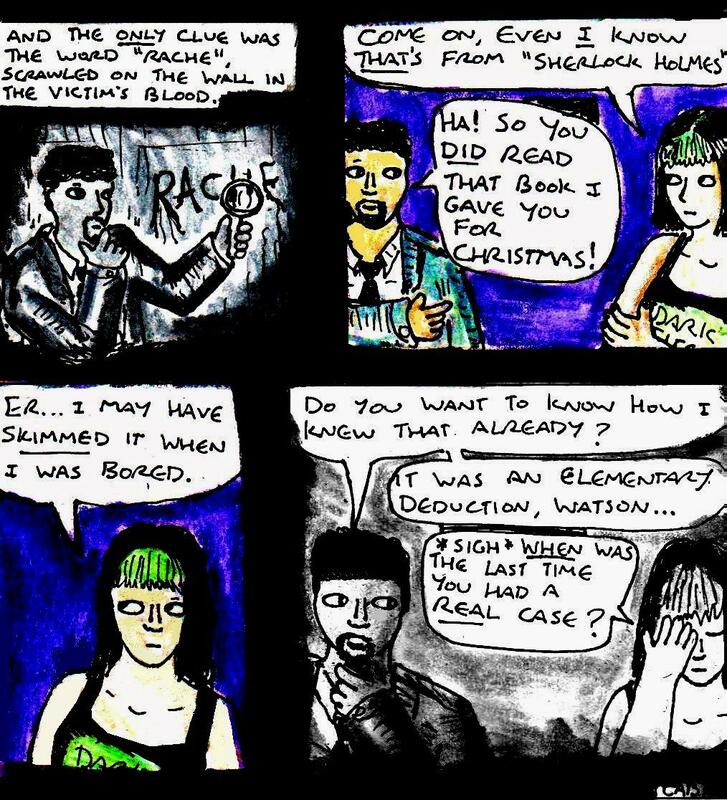 9) “Damania Referendum – Derek Votes”: This was the funniest and most inspired comic in a series of four comic updates I posted here before the E.U. Referendum in June. Originally, I’d planned to have Derek deliver a “serious” speech about the “leave” side. But, shortly before I made the comic, a much better, much funnier and more in-character idea for Derek’s comic suddenly appeared in my mind…. 8) “Damania Redux – Splatterpunk”: This was the very first modern-style “Damania” webcomic update that I posted online (this one or this one was the first one I actually made) and it was inspired by my own nostalgic memories about the second-hand 1970s-90s splatterpunk novels I used to read when I was a teenager. Originally, when I re-started this comic series, I’d planned to mostly just re-make some of my older comics from 2012/2013 but, as soon as I had this idea, I decided to make original comics instead. So, this comic is pivotal to the existence of my webcomic in it’s current form. 7) “Damania Resurrected – Detectives”: Although the punchline in this comic was a little bit weak, this comic just has to go on the list for the simple reason that I just couldn’t stop laughing whenever I looked at the third panel of this comic. Not only that, I really liked the characterisation in this comic – since Harvey and Roz are both being themselves in the strongest possible way. 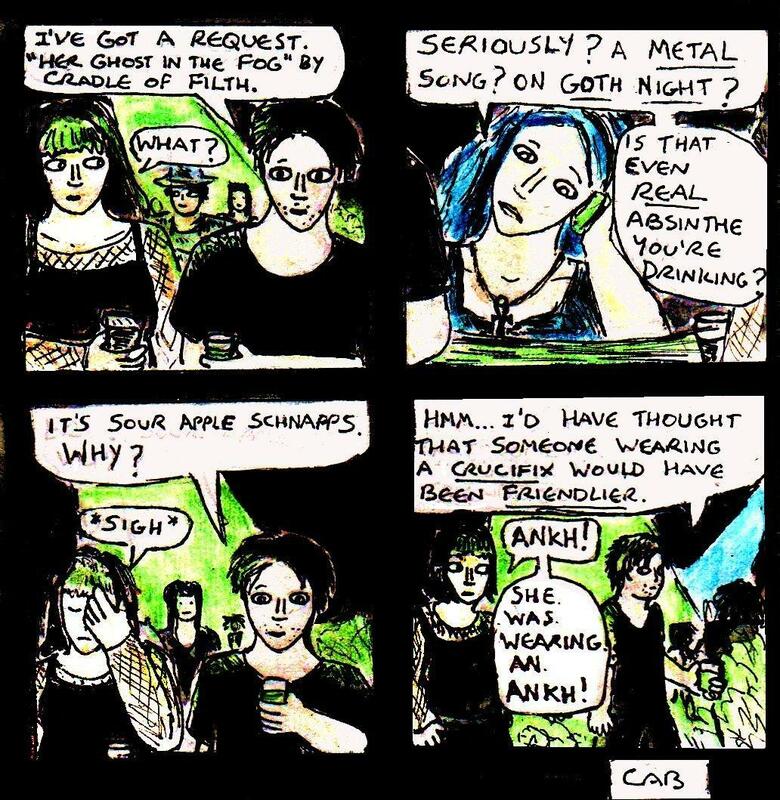 6) “Damania Reappears – Punk Night”: This was the second comic in a series of running jokes about nightclubs (here are the first and third comics). Like with the previous comic on the list, this was one of those comics that just made me laugh out loud whenever I saw it. 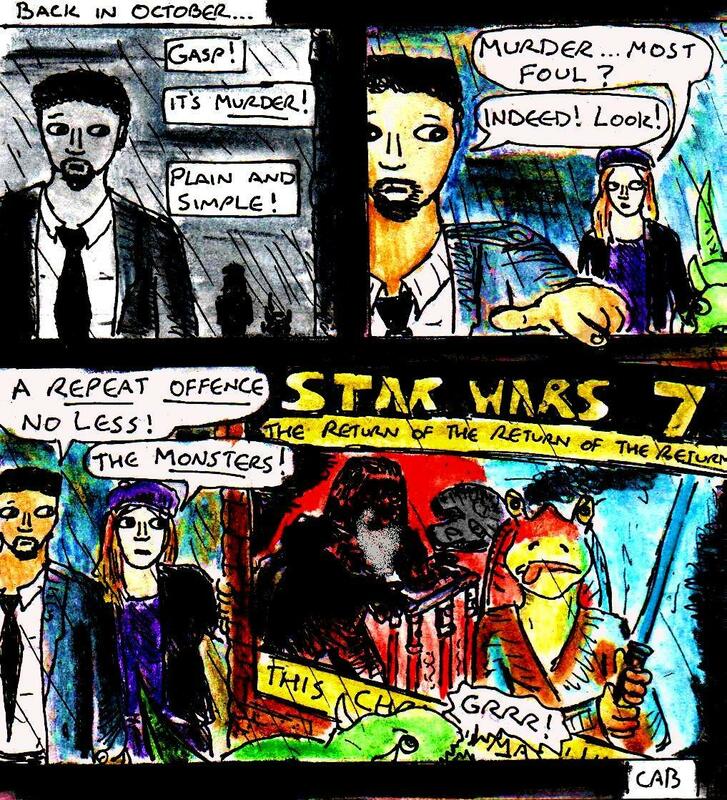 5) Damania Resurrected – FPS IRL: This was a comic that was inspired by both my own memories of going paintballing once when I was about seventeen and this TV Tropes page. Not only did I get to add a lot of action to the artwork in this cartoon, but I also had the hilarious experience of showing Derek treating paintballing like it’s an old FPS game. 4) Damania Resurgence – Debunked: Although this comic suffered from a bit of self-censorship (originally, the third panel would have included a large pair of breasts), it’s one of my favourite comics for a number of reasons. First of all, I found the idea of Harvey and Rox debunking seances to be absolutely hilarious. Secondly, I had an excuse to make the kind of gloomy, gothic artwork that I’m best at making. But, most importantly of all, this comic established one of the main ‘rules’ of my new “Damania” comics – namely that the comics can include zombies, but they can’t include ghosts. This rule has had a notable effect on several subsequent comics. 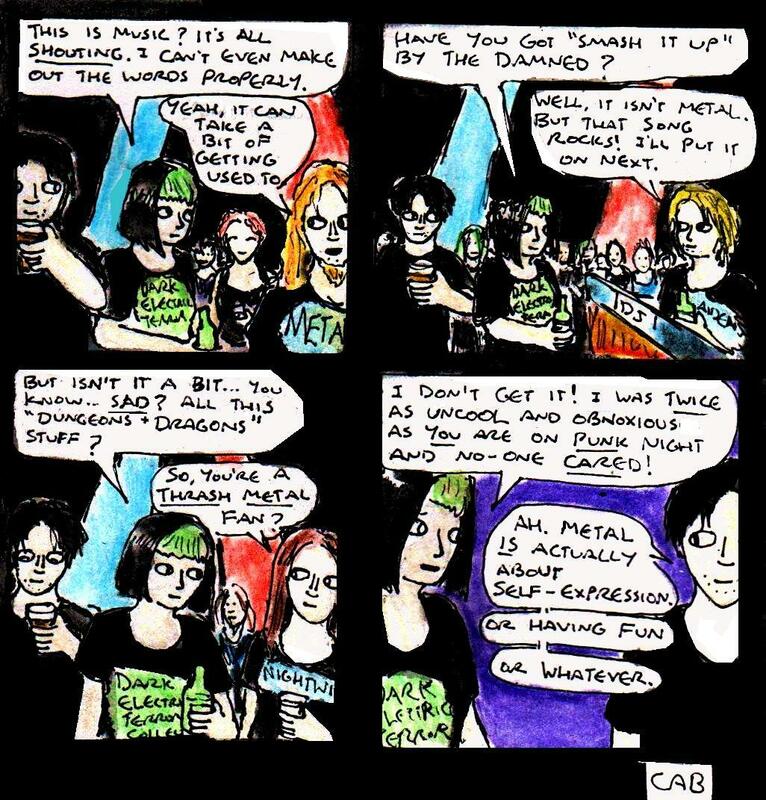 3) “Damania Redux – Was Better In 1998”: This early comic was a pivotal part of Rox’s character development, since it is the moment that she went from being the generic goth/punk character (who occasionally played old games) that she was in 2012/2013, to being the 1990s-obsessed retro technology enthusiast that she is today. Not only that, I had an absolute whale of a time with the final panel 🙂 Everything from drawing the 1990s fashions, to writing the radical 1990s-style dialogue was just incredibly fun. 2) “Damania – A Cynical Christmas (2016) – Shopping”: My favourite mini series of 2016 was probably the one I posted just before Christmas. Well, I wasn’t really feeling as inspired as I’d hoped when I made today’s digitally-edited painting. I’d planned to make a painting based on a nightmare I’d had the night before, but the picture quickly went in a different (and mildly less creepy) direction, with the only vestige of the original idea being the little Grim Reaper figurine (which looks more adorable than ominously creepy, when compared to the original nightmare – where several of these figures suddenly appeared in a room, closed followed by Grim himself, who decided to levitate me for some reason. This all happened because, in the dream, I made the mistake of noticing that an old agricultural scythe I’d found in a garage made me think about the grim reaper. Generally, if you start thinking strongly about something in a dream, it has a good chance of showing up fairly quickly. It’s like a hyper-accelerated version of “The Secret” LOL!!!.). Although this is an article about finding artistic inspiration (and creative inspiration in general), I’m going to have to start by talking about my own artistic uninspiration and how I was able to find some level of inspiration again. As usual, there’s a reason why I’m mentioning this stuff. But, if you aren’t interested in reading that part of this article, then just skip the next four paragraphs or so. In the days before writing this article, I’d been feeling artistically uninspired. Most of the paintings that I was preparing for mid-January were uninspired, minimalist things. My mood and attitude when making them was a world apart from the mood that I am in when making larger creative projects. Whilst trying to think of an idea for today’s article, I ended up procrastinating and playing some fan-made levels for a computer game called “Blood” that I’d been playing a lot recently. It was then that I remembered that “Blood” was one of several inspirations behind an interactive story I wrote last Halloween. Although the project was quite a challenge at the time, it was one of those inspired projects that “almost made itself”. Suddenly, I started looking back on this project with rose-tinted spectacles and began to wish that I could make it again. Then my mind turned to some of the art that I was making around that time, and how it seemed a lot more “inspired” and “meaningful” than any of the art I’d prepared for mid-January. Back then, I was making art series more regularly. These were often themed around things that had inspired me. I made a series of paintings including things I considered “awesome”. I made at least one series of cyberpunk-themed paintings. I made one or two series of horror-themed paintings. I was inspired by things in these genres and I found a way to use that inspiration to make original art that felt “relevant” to me. Remembering more inspired times can be a very useful tool in becoming inspired again for at least two reasons. The first reason is that remembering a number of more inspired times can help you to work out what those times had in common. Generally speaking, although the reasons why you may have been inspired during several different times will be slightly different, there will often be similarities. For example, many of my own “inspired” times were when I was either highly inspired by something (eg: a genre, a particular creative work) and wanted to create things that were influenced by it or evocative of it in some subtle way. Likewise, whenever I’ve made comics projects about special occasions that I like, I’ve been more inspired. I mean, this year’s Halloween comic was one of those projects that “made itself”. I could go on, but there are a number of common factors between the times that I have felt more inspired. Of course, your own reasons for why a particular time in your life was “more inspirational” than the present day will differ, but you can work out those reasons by studying the times when you felt more inspired. The second reason is you can take a more direct route by trying to create something similar to the things that you created during these “inspired” times. For example, a while before writing this article, I thought about making another “awesome stuff” art series, since I remembered how fun the first series was to make. This is a bit of a tricky thing to get right though. If you are going to re-tread old ground, then you need to do it using at least vaguely new ideas. You need to look at the core idea of what made your original project so great and then try to do something subtly different with that idea. Or, at the very least, you should try to continue what you’ve already made (eg: make your new project more of a sequel than a remake). If you look at your memories of being inspired with these two things (analysis and re-working) in mind, then you’ll also hopefully also avoid the pitfall of feeling melancholy about the present day or feeling that the past was a better time where you made better things. If you start thinking things like that, you’ll just end up feeling more uninspired. So, remember to analyse why you were inspired and remember to find interesting ways to create similar (but different) things to the things you made when you were inspired. Well, like with yesterday’s painting, today’s digitally-edited painting began with a sudden moment of inspiration. However, although I’d originally imagined an idyllic French fishing village, the setting of the finished painting looks more like a cross between Scandinavia, Switzerland, Canada and Britain, I guess.